EXETER, PA - Quantum Rehab® is pleased to announce an industry-first toward enhanced power chair safety with the launch of its crash tested and WC19-compliant iLevel® and TRU-Balance® 3 power seating systems. WC19 is the ANSI/RESNA testing standard that qualifies the characteristics and testing standards to which mobility devices must pass in order for a wheelchair to serve as an occupied seat in a motor vehicle. 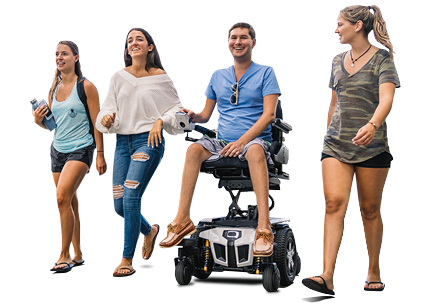 Quantum is the first power chair manufacturer to offer power tilt-and-recline, articulating foot platform, and elevating seating that meets the standard. "Our goal is to provide the safest complex rehab products possible for real-world use," says Jean Sayre, Senior Director of Quantum Clinical Development. "Many who use complex rehab power chairs need power seating and can't transfer out of their chairs for transport. As a result, occupied power chair transport in vehicles is vital, and we've known the historical limitations on non-crash-tested power seating systems. We're pleased to be the first in the industry to have power seating that's fully crash tested and WC19-complient for safer transport." WC19-compliant power seating is available on the Quantum Q6 Edge® 2.0 with TRU-Balance® 3 Tilt-and-Recline, Articulating Foot Platform, and iLevel® elevation technology, configured individually or together, with up to a 300 lb. user weight capacity.